Is there a secret to happiness? 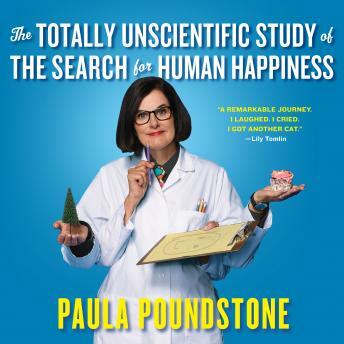 Beloved comedian Paula Poundstone conducts a series of 'thoroughly scientific' experiments to find out, offering herself up as a guinea pig and recording her data for the benefit of all humankind. Armed with her unique brand of self-deprecating wit and the scientific method, in each chapter Paula tries out a different get-happy hypothesis. She gets in shape with taekwondo. She drives fast behind the wheel of a Lamborghini. She communes with nature while camping with her daughter. Swing dancing? Meditation? Volunteering? Does any of it bring her happiness? And more important, can the happiness last when she returns to the daily demands of her chaotic life? The results are irreverent, laugh-out-loud funny, and pointedly relevant to our times. The Totally Unscientific Study of the Search for Human Happiness is both a hilarious story of jumping into new experiences with both feet and a surprisingly poignant tale of a working mother raising three kids. Paula is a master of her craft. Her comedic brilliance, served up in abundance in this book, has been compared to that of George Carlin, Tina Fey, Lily Tomlin, and David Sedaris.